Each winter as the temperatures in Alaska dip well below zero, the frozen rivers and lakes become highways and byways for many rural Alaskans. Just a short distance outside Fairbanks, one of Alaska’s largest cities, the lack of traditional roads and bridges reminds one just how rural and rugged a large part of Alaska is. With few traditional roads, many rural Alaskans navigate the seemingly frozen bodies of water on snowmobiles and dog sleds. And all too often they come in contact with dangerous ice. This is something ecologists Knut Kielland and his colleague Bill Schneider, an oral historian, know all too well. 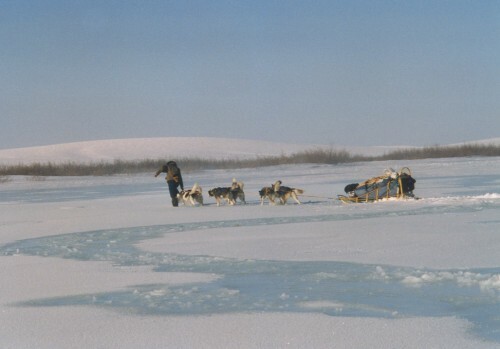 Kielland and Schneider, both avid dog mushers and researchers at University of Alaska, Fairbanks (UAF), have been criss-crossing the Alaska countryside along the Tanana River outside of Fairbanks for nearly 25 years. During that time the two have certainly run into their fair share of dangerous ice, but there were several unusual phenomena associated with dangerous ice that piqued their interest. 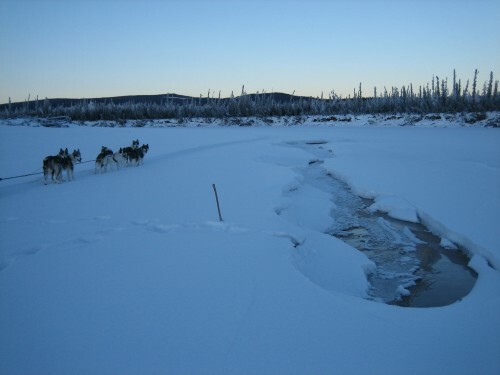 With support from the National Science Foundation, Kielland, Schneider and a multidisciplinary team of researchers set out to study and map the physical conditions behind winter dangerous ice conditions, as well as document local knowledge and observations across a 200-mile study area near the Tanana River. The data from the project will help scientists understand the forces behind dangerous ice, and give rural Alaskans tools that may improve public safety. Kielland wanted to study dangerous ice from multiple angles, including human interactions with this natural force. To do that, Kielland paired teams of natural scientists with oral historians and ethnographers to take a holistic approach. “In terms of the multidisciplinary approach, we’re talking about climatology, hydrology and the physics of snow and ice—that’s the natural science part. In terms of the social science, it’s both the science of going about how to collect oral histories and learning about how residents view and experience their environment, and more directly in terms of how they experience the changing winter conditions, particularly in regard to snow and ice conditions,” Kielland explained. Involving local communities in the study area has been a key part of the dangerous ice project. Many of the villagers and townspeople have traveled the frozen rivers and lakes for decades and have valuable knowledge and insight that machines and computers simply can’t duplicate. To gather data on how locals call upon years of experience and training to frame their descriptions and evaluate ice conditions, Kielland looked to his longtime friend and oral historian Bill Schneider to record interviews with locals. Having lived and worked in Alaska for decades, it was relatively easy to tap the wealth of knowledge about rural Alaska’s frozen highways. “Because we’ve lived here for a while, we have friends and acquaintances—and acquaintances of acquaintances—in a variety of communities. We were very fortunate that we could pretty much come into a community and establish a rapport with them,” Kielland said. The team worked with communities in Fairbanks, Manley and the village of Tanana to gather their observations on the distribution and abundance of dangerous ice phenomena and how they impact subsistence activities and travel throughout the winter. With help from Karen Brewster, a research associate for the Oral History Program at UAF, the team has hosted several workshops and interviews in the field with river travelers, the results of which are now being posted online. “We do semi-direct interview [s], take a lot of photographs and videotap[e]ing of areas and interviews,” Kielland said. Interviews and photos from the dangerous ice project are made publicly available through the University of Alaska Fairbanks’ Project Jukebox. The combination of physical data and recorded oral histories has started to crack some of the mysteries of dangerous ice, shedding new light on the phenomena and how rural Alaskans deal with it. Some of the initial findings are a bit of a surprise to Kielland and his colleagues. Initially, he hypothesized that dangerous ice occurrences were tied to shallower (< 1 m) portions of the river more susceptible to melting from below due to ground water upwelling. However, that’s not always the case. The team has observed cases of dangerous ice in deeper waters (> 3 m). Kielland has also documented very localized instances of dangerous ice where, “it’s almost like somebody sat down at the bottom [of the river or lake] with a laser and shot a hole in the ice. Hydrologists on the project are still working to understand the physics behind such localized events. Although winters in Alaska are getting warmer on the whole, dangerous ice phenomena aren’t necessarily a direct consequence of climate change. “Winters in Alaska are getting warmer and climate predictions call for more snow. Both of those factors will probably exacerbate the situation, if anything, but we don’t consider this a direct consequence of warming. As I mentioned, we see the phenomenon even when it’s very cold out,” he said. With the second year of the dangerous ice project now coming to a close, Kielland and Schneider hope to extend it for one more year to continue unraveling the mysteries behind dangerous ice. The lessons learned from this project will not only tell us where dangerous ice is located and it’s potential causes, they will also help rural Alaskans avoid a wintertime problem that claims lives every year.